Westward Ho! (with it's jolly exclamation mark - the only town in the UK to have one) has become my new favourite beach in Devon. When the tide is out there are huge stretches of sand and so much S P A C E. There is often a thin film of water on the sand which provides some beautiful reflections of the clouds, making the space look even bigger. There are beautiful sand dunes (Northam Burrows) and beautiful giant pebbles (originating from Hartland I believe and smoothed and tumbled by the sea to end up here). It's a popular beach with surfers and dog walkers. I recommend parking at Northam Burrows for access to the best bit of the beach. It cost us £3.50 for the day in June (you can also get weekly and seasonal passes). It's one of those places that looks so different every time you visit, depending on the tide and the weather - it's quite literally a reflection of the world around us. Even on the evening we visited (after a scorcher of a day with a cloudless sky) the view kept shifting and changing with the clouds and the light - and what magical light it was! We had so much fun strolling up and down the beach, splashing in the waves and just drinking it all in. So many people were out and about enjoying the perfect evening, cooling off after a hot day. I loved the soft sinking sand that left deep footprints as you walked - I turn into a big kid on the beach! On another visit, we spent some time nestling in the dunes, sheltering from the wind. And pebble hunting, of course! The pebbles here have beautiful white rings and lines. There is nothing more joyful than holding smooth warm pebbles in your hands with the sun on your face and the sand in your feet. Oh yes, it's most definitely the simple things in life for me! And finally, I must just mention the beach huts. You can find a small row of pretty pastel huts at the end of the beach where all the shops and restaurants are. They never fail to make me smile! Next on the list has to be Saunton Sands. It held the no.1 spot in my heart for many years and has only just been pipped at the post by Westward Ho! It's just round the corner really from Westward Ho! (although it's about a 40 minute drive as you have to go round the estuary) and shares many similarities. There's always huge stretches of sand to be found, even at high tide. I just love the S P A C E (bit of a theme?!) and the energy this beach has - there are always surfers to be found and lots of dog walkers and families and people generally having fun. There are some cafes, a posh hotel, surf board hire/lessons and deckchairs/beach huts to hire for the day. And parking will set you back £6.50 - at least it did in June 2015! 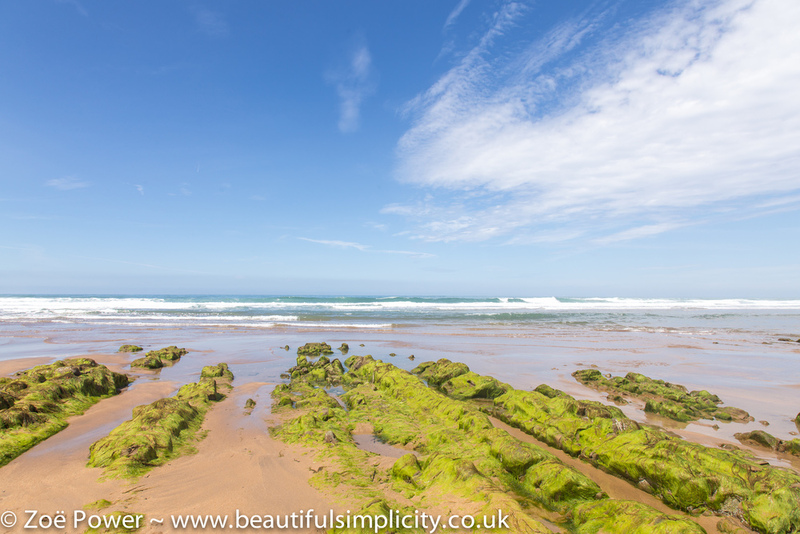 Saunton Sands is also great for reflections as it usually has a thin film of water covering a large stretch of sand - just add some clouds - and voila! These photos are from a visit several years ago. When we visited this time it was a scorching hot day with no clouds so it wasn't very photogenic - and we were so hot we actually had to leave!! Unheard of in Britain! The sand dunes (Braunton Burrows) are beautiful too - and vast! You could walk for hours - in fact we once did, as my sister took us on a "short cut" to the beach that had us getting lost for hours (the best kind of fun)...... You can find lots more photos in my Saunton Sands album on Flickr. Putsborough beach is round the corner again from Saunton Sands, just past Croyde - Woolacombe is the opposite end. It's another lovely big stretch of sand with some interesting rocks and a cafe I like to hole up in when the weather is colder. Also popular with surfers. There are lots of facilities at the Woolacombe end (which gets very busy). Hartland is wild and rugged. Huge jagged rocks that you can imagine ships smashing into in times gone past. I don't actually have any photos of Hartland itself to share here - every time we've visited it's been very grey and stormy. I absolutely love it, though. It's quite a long drive down narrow roads and you really feel "away from it all". There are some lovely walks you can do in this area. We did the circular walk from Hartland Quay to Spekes Mill waterfall and Docton Mill Gardens and back - lots of rugged coastline and pretty leafy green lanes. The heavens opened and we got soaked on the way round, but I still loved it. I will take wild and peaceful over hot, busy and crowded any day! You can find out more info at hartlandpeninsula.co.uk. The beautiful Hartland Abbey and Gardens is also worth a visit - I've enjoyed bluebell walks in the spring and remember lots of colourful camellias, rhododendrons, and magnolias everywhere. I do have some photos of Welcome Mouth, however. It is a beautiful beach really tucked away down super narrow country lanes (the kind you breathe in as you drive through! ), a bit of a drive from Hartland Quay. As it is so hard to get to, and there are no facilities, it is usually very quiet. We came here on a landscape photography course several years back and had fun playing around with long exposures as the tide came in. The rocks here are similar to Hartland and remind me of backbones. OK, so Sandymouth isn't in Devon, so I'm stretching things a little. But it is just over the border in North Cornwall (just North of Bude) and SO worth a visit if you are in the area. It has a very special place in my heart. Sandymouth is in the care of the National Trust who run the car park and a rather lovely cafe. The beach has large stretches of beautiful sand when the tide is out, and beautiful pebbles, similar to those you will find at Westward Ho! (spotting a pattern here?!). The cliffs are stunning and the rocks fascinating. You will find lots of similarities to the Hartland Peninsula, which isn't far away. It's also hugely popular with surfers (there is seasonal lifeguard cover) and dog walkers (you can walk dogs year round). It offers huge variety in terms of landscape and I love how different it always looks on the many visits I have made here. This is the view from the outside seating area at Sandymouth cafe, looking down on the beach - not a bad spot for lunch! The backbone type rocks at Sandymouth were covered in green seaweed this visit - looking very colourful! Watersmeet is a beautiful woodland area in Lynmouth with lots of lovely walks alongside rivers and streams and waterfalls. It is the meeting place of the East Lyn river and Hoar Oak Water. It is in the care of the National Trust, who run a perfectly situated cafe right by the water. I love coming here for a good dose of green and peace and quiet and always come back feeling refreshed and restored. The walk from Lynmouth is particularly lovely. There are lots of other things to do in nearby Lynton and Lynmouth too - see www.visitlyntonandlynmouth.com for more information. Watersmeet is another great spot for long exposure photography - bring your tripod (there's not much light under the canopy of trees) - and your wellies! If you like vintage clothes, fabrics and other paraphernalia then you will LOVE Donna Flower's vintage shop in Barnstaple. It's packed full of beautifully curated collections of good quality vintage clothing and accessories and hard to find vintage fabrics and sewing paraphernalia. Everything is displayed so beautifully and the ever changing window displays are pretty special. Donna has sourced lots of beautiful wooden display cabinets and drawers, all very swoon-worthy. She runs the shop with her daughter, Jasmine. You really must pay a visit! Appledore is a small fishing village near Westward Ho! and Bideford, across the water from Instow. You will find lots of narrow cobbled streets lined with bunting and pretty pastel houses with beautiful flowers everywhere. There are a few cafes and art galleries and antique shops to nosey around. You can also go on boat trips from the quay and enjoy many other watersports. The attraction for me, of course, was the pretty pastel houses - I do love strolling around quaint streets marvelling at people's pretty houses and gardens! Clovelly is a private village, with steep cobbled streets leading down to a harbour. There are no cars and you have to pay an admission fee to enter, to help towards the upkeep of the historical buildings. It's very pretty - I loved photographing all the doors and flowers. There are some beautiful gardens and lovely walks and boat trips and donkey rides, if that is your thing! I couldn't complete this list without mentioning at least one garden! As you will probably have gathered, I adore the coast, so my trips usually focus around visiting as many beaches as possible. I do love a good garden, though, and Rosemoor doesn't disappoint. It is one of four RHS gardens and is pretty sizeable, with many gardens within the garden. There is also a large woodland area which is good for walks. It's been a while since I've visited, though, so the RHS Rosemoor website will be able to give you a much better overview of current highlights. Other gardens I've enjoyed visiting include Broomhill Sculpture Gardens, Marwood Hill Gardens, and the previously mentioned Docton Mill and Gardens and Hartland Abbey and Gardens. So that's it - my favourite places to visit in North Devon. Next on the list is Lundy island. What are your favourite places to visit in North Devon? I'd love to hear your recommendations, especially those off the beaten track.